AKIPRESS.COM - The World Cup trophy has arrived in Mongolia for the first time early on Monday, reports Montsame news agency. The gold trophy was brought with honor to the Mongolian Football Federation (MFF) at 11 am. President of Mongolia Khaltmaa Battulga received the golden trophy and took photo with Mongolian football team players. 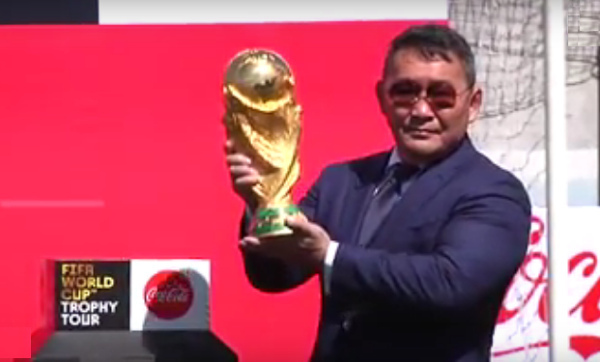 President Battulga has become the only Mongolian who touched the golden trophy as only the winners of the of the FIFA World Cup or the President of the FIFA country can touch the trophy.. The FIFA has placed the trophy at the Shangri-La Hotel, Ulaanbaatar between 1 pm and 8 pm, allowing Mongolian football fans to see and take photos. In September 2017, the FIFA World Cup Trophy Tour by Coca-Cola started in Moscow, Russia. The trophy stayed in Russia until December before starting global tour to cover over 50 countries including Mongolia.